When the blind spot monitor main switch assembly (warning canceling switch assembly) is turned on, a signal is sent to the blind spot monitor sensor LH. The blind spot monitor system operates according to this signal. (d) Enter the following menus: Body Electrical / Blind Spot Monitor Master / Data List. The display changes as shown above when the blind spot monitor main switch assembly is operated. The display does not change as shown above when the blind spot monitor main switch assembly is operated. (a) Remove the blind spot monitor main switch assembly (See page ). (b) Inspect the blind spot monitor main switch assembly (See page ). (a) Disconnect the blind spot monitor main switch assembly connector. (a) Disconnect the B12 blind spot monitor sensor LH connector. 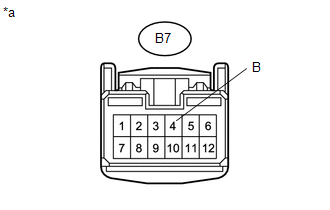 (b) Disconnect the B7 blind spot monitor main switch assembly connector.